Is Amsterdam in the spell of Schiphol and the advancing concrete fungus? No! A small settlement bravely resists these conquerors and makes it difficult for the shady speculators in this area. Trapped between Schiphol airport and Amsterdam lies the 'Lutkemeerpolder'. The southern area has been used for agriculture for the past 100 years. Nowadays mainly organic crops are grown on the fertile clay-ground. Developer SADC (Schiphol Area Development Company), of which Amsterdam and Schiphol are both important stakeholders, plans to destroy this beautiful area, covering the organic soil with sand, so they can build warehouses in the future. Any help is welcome: building up, cooking, preparing an exhibition or workshop? Perhaps you think of a funny action or are you involved with a potential solidarity organization. So: grind polish your rake, look for your tent in the attic, dust off your action-suit, bring some spraypaint and old cloth, and join us September 14th at 9 pm in the Lutkemeepolder. Stay up to date on in between info via the site www.behoudlutkemeer.nl or follow us on facebook. Remember to bring cash, there will be no PIN at the camp. And bring a fork to donate to our next action! 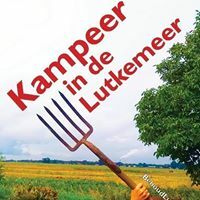 We are an action group dedicated to saving the Lutkemeer Polder,an important agricultural space, from being paved over for another indutrial business park for Schipol Airport.